Two Russian cosmonauts floated outside the International Space Station Thursday, tossed five small science and technology satellites overboard and spent the rest of the excursion servicing external experiments and carrying out routine but time-consuming inspections and maintenance. The work took longer than expected and Russian flight controllers extended the spacewalk beyond the planned six-hour mark to give the cosmonauts time to finish as many of their tasks as possible before calling it a day. Finally, at 6:10 p.m. EDT (GMT-4), Expedition 52 commander Fyodor Yurchikhin and flight engineer Sergey Ryazanskiy closed the Pirs airlock hatch to officially end a seven-hour 34-minute spacewalk, the first in more than a year by Russian cosmonauts. 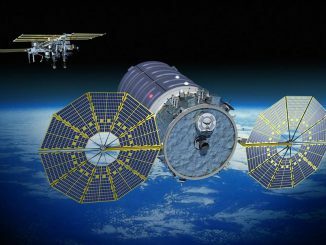 Mission managers said the spacewalkers accomplished all of their planned tasks except for one — the installation of one handrail — and that no specific problem put them behind schedule. Rather, the spacewalkers took their time and rested periodically at the insistence of Russian flight controllers. “Well, if we could have some music, maybe, and girls to make massages it would of course be even better, but everything is fine,” Ryazanskiy replied. 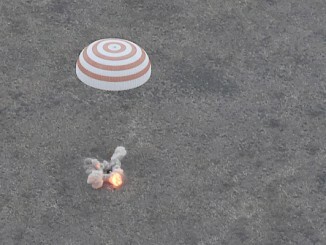 “When we are back on the ground we’ll discuss it,” Ryazanskiy said. 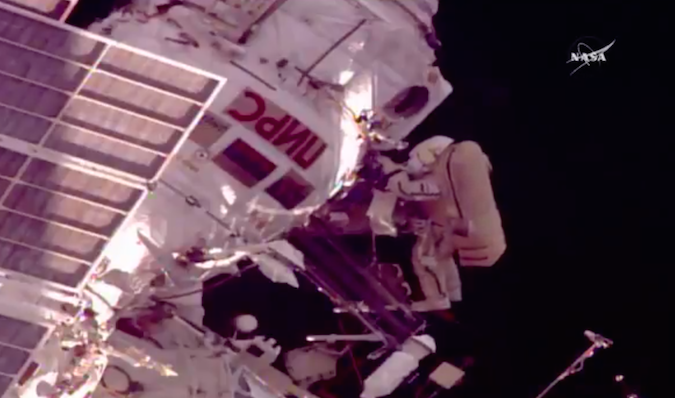 The spacewalk got underway at 10:36 a.m. It was the ninth EVA overall for Yurchikhin and the fourth for Ryazanskiy. Yurchikhin wore an upgraded Orlan MKS spacesuit with an improved temperature control system, a larger feed water bag, a new carbon dioxide measuring unit, improved biomedical sensors and an upgraded LCD display panel. The MKS suits will enable cosmonauts to carry out longer spacewalks than are possible with the standard MK-series like the one Ryazanskiy used. After exiting the Pirs module, the cosmonauts retrieved a materials science sample pallet just outside the hatch before manually launching the five satellites one at a time, careful to aim then down and behind the station to prevent any future close encounters. 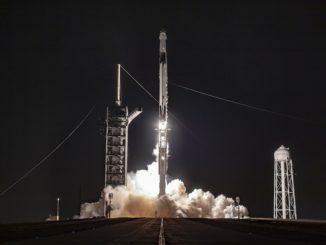 The first to be launched, known at “Tomsk,” is an 11-pound satellite built with a 3D printer to help engineers how such materials respond to the space environment. It also carries amateur radio gear. After releasing the satellites, Yurchikhin and Ryazanskiy took photos of another experiment panel and an antenna boom before installing handrails and struts to help future spacewalkers move about the Russian segment of the space station. They also installed 10 temperature sensors on the Poisk module and serviced another external experiment before returning to Pirs and ending the spacewalk. But it was slow going throughout the day. They insisted they could install the final handrail, but flight controllers told them to head back to Pirs. This was the 202nd spacewalk devoted to station assembly and maintenance since construction began in 1998, the seventh so far this year and the first of 2017 by Russian cosmonauts. Total station spacewalk time now stands at 1,258 hours and 15 minutes, or 52.4 days. Yurchikhin has now logged 59 hours and 28 minutes of spacewalk time during nine EVAs, moving him up to fourth on the list of most experienced spacewalkers, just behind crewmate Peggy Whitson. She has 60 hours and 21 minutes of spacewalk time during 10 excursions. Ryazanskiy’s mark stands at 27 hours and 39 minutes outside the station during his four excursions.